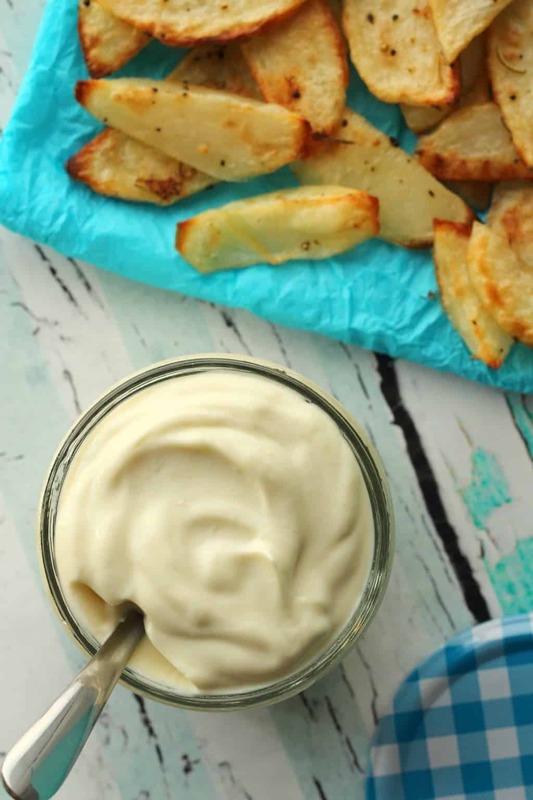 This vegan mayo is like magic really. You just put 6 easy ingredients into a jug, blend it up with an immersion blender and like magic, you have vegan mayo! The first time I made it I could barely believe it could be possible and when it all just worked I was so excited! I have since tried all kinds of combinations (not all were super successful!) but this recipe is a sure winner! Avocado oil is the base of this recipe and I really love it for this as it’s a wonderfully neutral flavored oil. I also tried canola oil and it was also good but not nearly as good as the avocado oil. I mixed in a bit of olive oil for flavor balance and that worked really great. I don’t think using olive oil alone would be a good fit for this though I didn’t try that out, just reading other reviews I believe the taste can be a bit strong. There is no ‘egg replacement’ in this recipe! 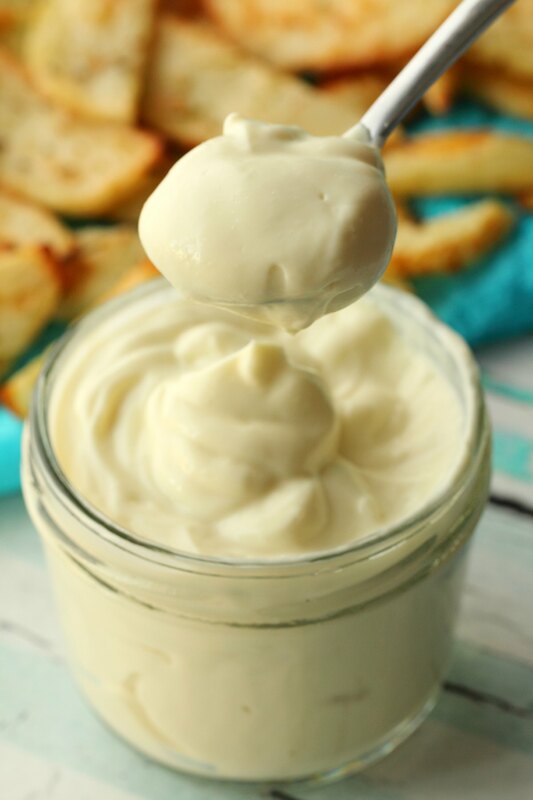 Other vegan mayonnaise recipes tend to use aquafaba but this recipe doesn’t use that. However! 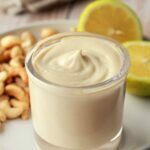 I actually have another vegan mayonnaise recipe that uses aquafaba, the result was so different that it warranted me doing TWO mayonnaise recipes for this blog. 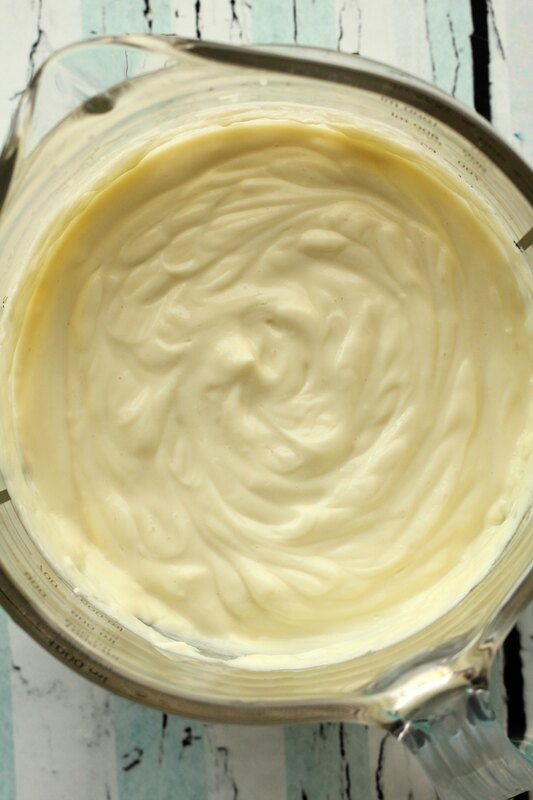 This recipe is thick and very mayonnaise-y, the other one that uses aquafaba is thinner and more like a salad cream. 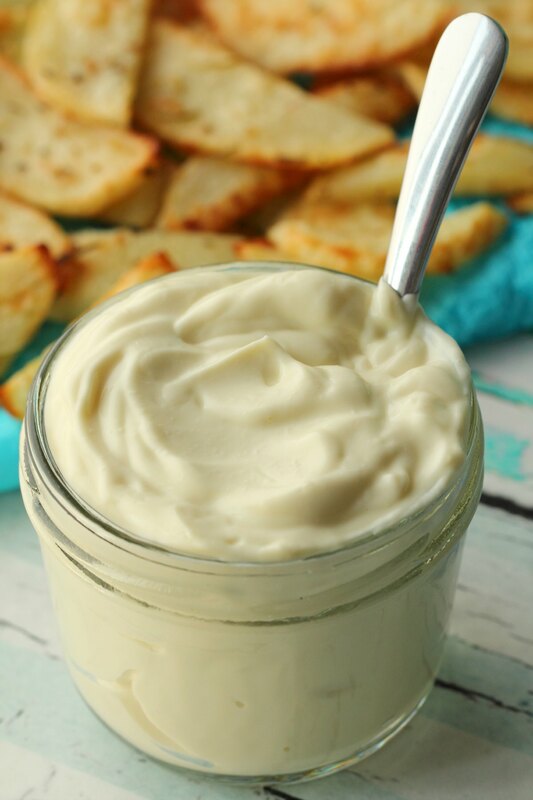 This recipe uses unsweetened soy milk and that provides the thickness that together with the oil creates this super thick vegan mayo that’s pretty much identical to what you would buy at the store! 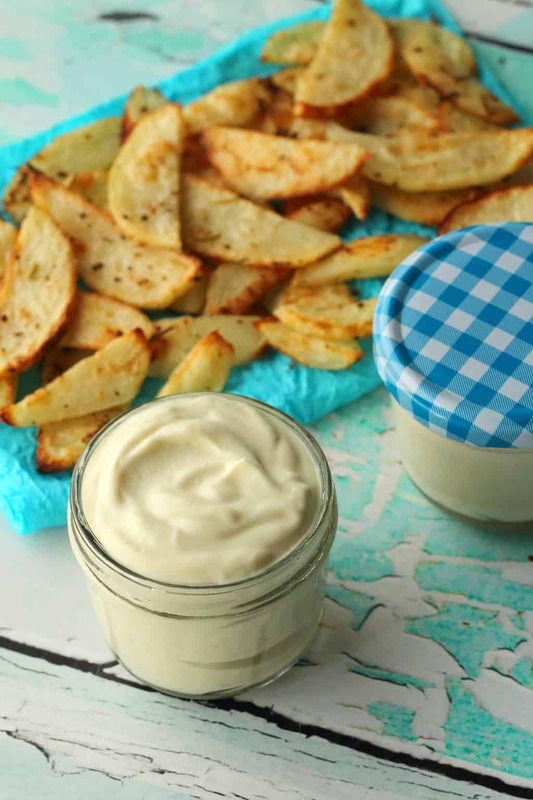 This vegan mayo is divine as a dip for your chips, as a spread, as a salad cream or dressing, or wherever a mayonnaise is required! 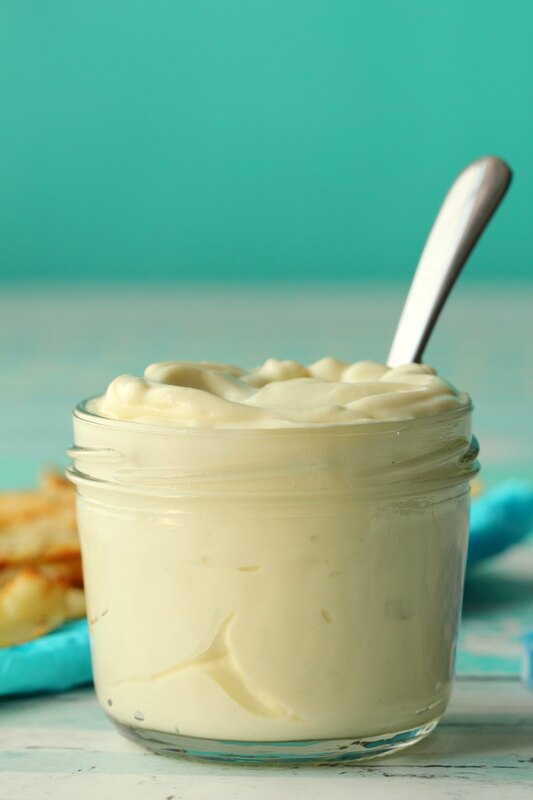 The only issue with homemade mayonnaise vs store-bought is that it doesn’t have the long shelf life. 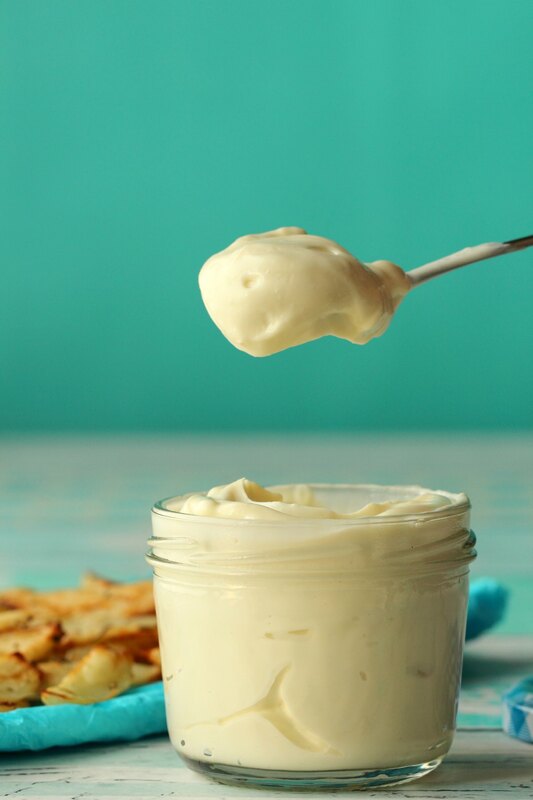 This vegan mayo will last around 5 days in the fridge. The oils are very stable, but the non-dairy milk is not. 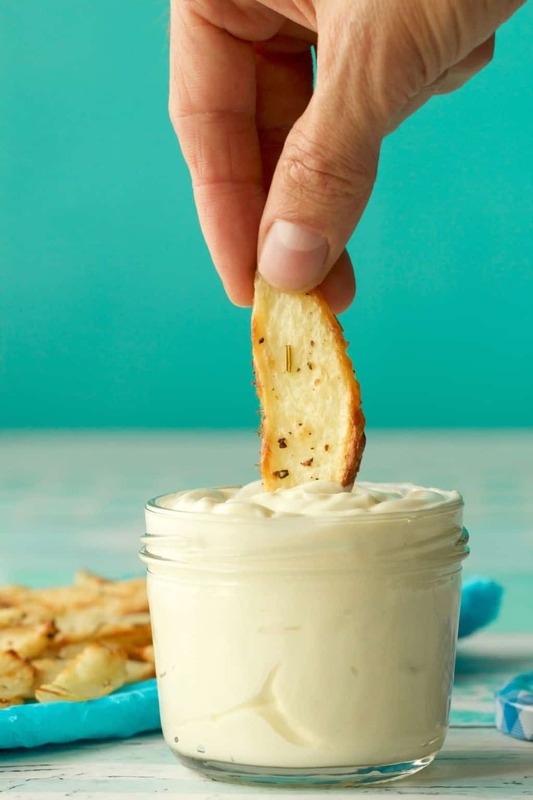 So if you’re not a big mayo eater, then maybe make a half batch! 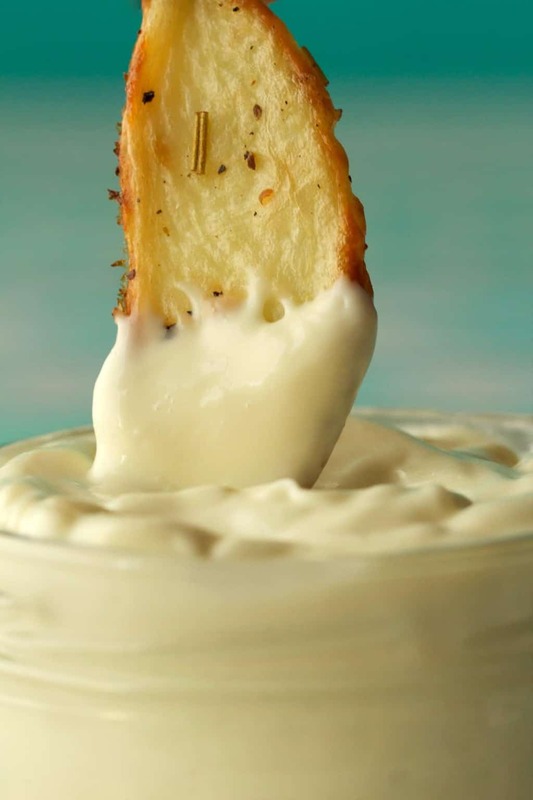 The mayo does tend to separate a bit in the fridge, don’t worry about that, just give it a stir and it’s good to go! I tried this with an immersion blender and in my regular blender, which is a Vitamix. My Vitamix is one with a speed control, so I start at slow speed. 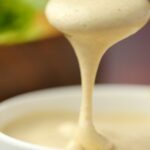 I haven’t had a problem with my mayo emulsifying using either the immersion blender or my Vitamix, starting at slow speed. I did have a terrible problem when I tried to do it in a stand mixer, it would not emulsify at all, no matter what speed setting I had it on. But that batch was saved when I just put it into a bowl and used the immersion blender to emulsify it. I also was not able to make it emulsify when trying it out in a food processor. I think the most consistent results are going to come about from using an immersion blender. Since all things are definitely not equal with regular full size blenders, but they are quite similar across brands of immersion blenders, this is going to be the most reliable way of making it. Also, as mentioned, I was able to ‘fix’ a batch that would not emulsify in a stand mixer by using the immersion blender. 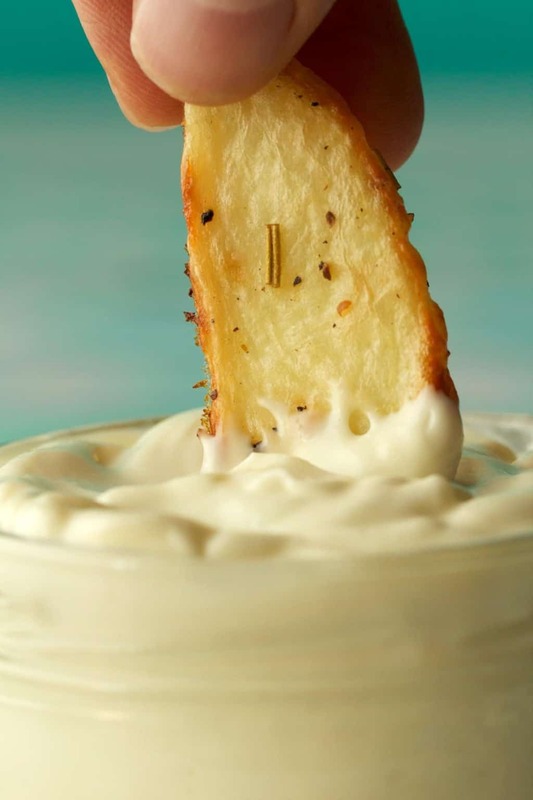 So if you think homemade mayo’s are in your future (and lots of soups!) then an immersion blender is a very worthwhile purchase. And usually inexpensive too. Your ingredients should also be at room temperature, if one of your ingredients (like your non-dairy milk) is cold from the fridge and your oil is room temperature, then that can cause this recipe to not work properly. So everything needs to be room temperature. It is crucial that your soy milk be unsweetened. I tried a batch with regular soy milk and there was a very odd after-taste. Even though we do add a little sweetener in to this (a little maple syrup) that doesn’t seem to have the impact that sweetened soy milk does, so make sure your milk is unsweetened. Unsweetened almond milk is likely an option as well, though I haven’t tested it. It would most probably lead to a thinner mayo since almond milk is a much thinner consistency than soy milk so that is something to consider. Store it in a sealed jar in the fridge where it will stay good for about 5 days. 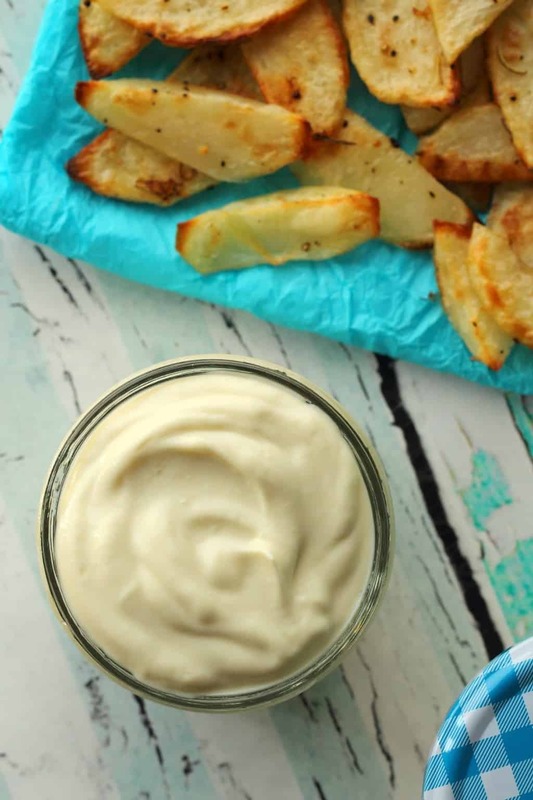 So let us know what you think of this easy vegan mayo in the comments! Rate the recipe too please, it’s so helpful! Thank you! 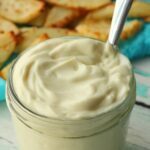 Rich and thick vegan mayo made with 6 easy ingredients and ready in 5 minutes from start to finish! 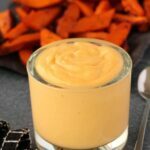 Ultra creamy, with just the right amount of tangy, this is so good you won’t believe you made it yourself! All all the ingredients to a bowl or measuring jug. 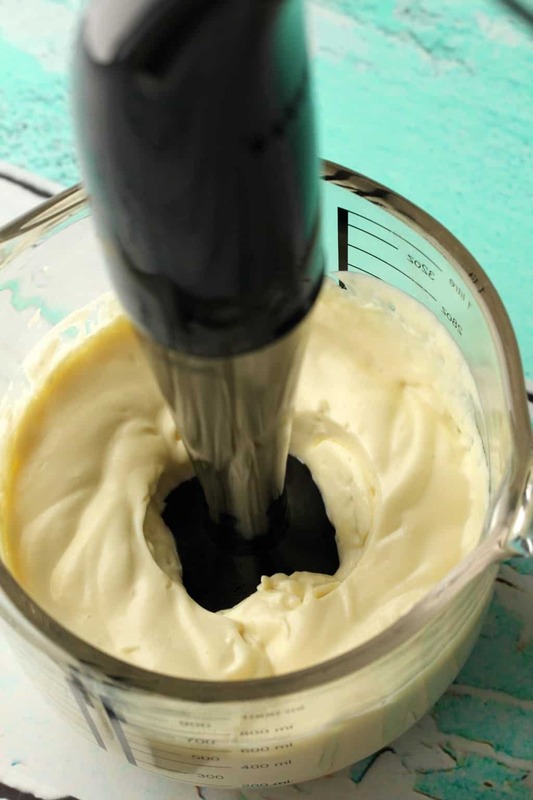 Use an immersion (handheld) blender to blend it into mayonnaise. 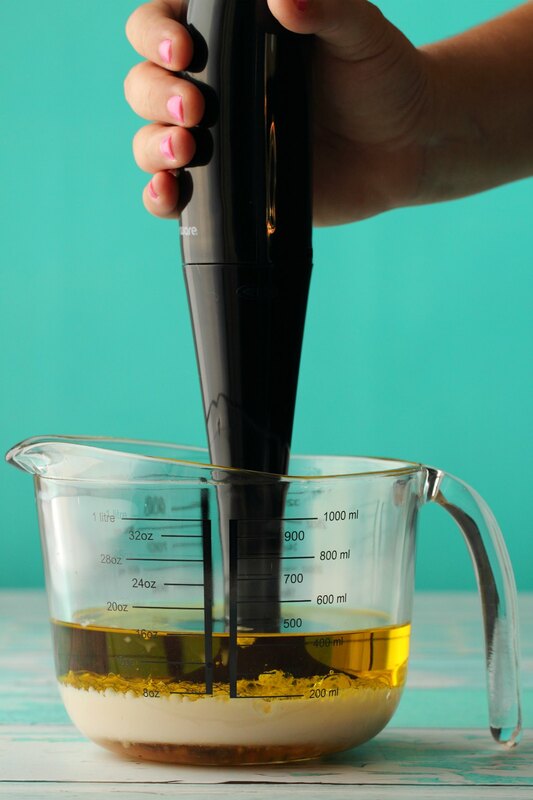 *You can use different oils other than avocado oil with varying taste results. *It is crucial that the non-dairy milk be unsweetened, using a regular sweetened variety gave this a very odd taste. *Ingredients must all be at room temperature otherwise this recipe may not work out as intended. *Recipe inspired by Mother Nature Network. *The fries served with the mayo are our baked potato fries! This is a great recipe. 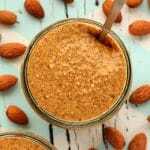 Since I can not have almonds, do you think that this recipe would work with coconut or cashew milk? Also, for how long it will last in the fridge? Thank you! 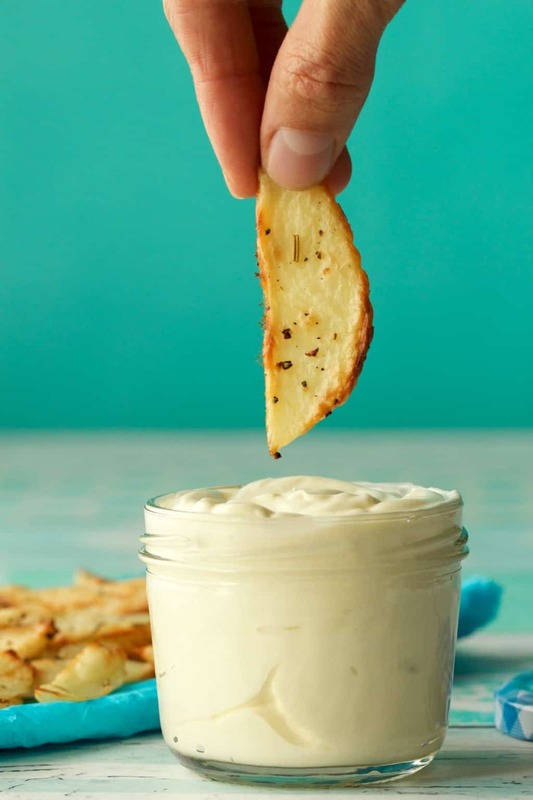 I had never done mayo (any kind) and was definitely surprised by how easily it’s texture could be achieved. I did use olive oil (not extra virgin though) only, because this was a last minute idea for dinner and the only other oil I had was coconut which would probably leave a heavier taste. It worked perfectly! I added a little bit of powdered garlic and pepper at the end and the taste and consistency were spot on. Will definitely try with avocado oil though. Not sure what I did wrong. I followed the recipe and blended until the motor on my blender just about died but the mayo never thickened. Help!!!! I’m not sure what went wrong, I tested this recipe in both a regular blender and with an immersion blender. 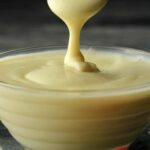 One of the things that can go wrong is if the ingredients are not at room temperature, but other than that I am not sure what else would cause it not to emulsify. Sorry to hear it didn’t work out. You wouldn’t be able to use a vitamix blender then? You can. I have tested it with both hand blender and vitamix. The consistency was perfect. But I didn’t have avocado oil so I used coconut oil which made it just taste like coconut . Do you think I can sub apple cider vinegar?? My daughter has a corn allergy so she cannot have white vinegar. Hi Bern, I’m not sure if apple cider vinegar would be a good flavor blend here. You could definitely use it, I am just worried it might not taste good, alternatively you can just leave out the vinegar altogether. Oh! Interesting! Thanks for sharing that info Callan. Mine didn’t get thick and creamy like your photo. It’s super runny like plain oil. What happened? The only thing different is I added a few more spices to make like a ranch flavor. Hi CJ, the ingredients all need to be at room temperature and it has to be made with either a hand blender (ideal) or a regular blender it can’t be made any other way, food processor or electric mixer will not work. I have never had it not work out when these crucial factors are adhered to, so other than that I don’t know what might have gone wrong. Yes everything was room temp. And I used s blender not a hand mixer or food processor. Amazing! 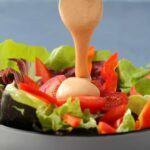 I can’t believe how easy it is to make your own mayo and this recipe tastes as good if not better than anything I can buy. Love it. Thanks. Mine turned out really badly. I’m not sure what happened. I followed the recipe exactly, used a regular blender and everything was at room temp. But it tasted God awful and the consistency is like watery oil. Such a waste, what could have gone wrong? So sorry to hear that Danielle, I can’t imagine what went wrong. I have never had this not work (with a blender, when I tried with a hand mixer it didn’t work!) so it’s very hard to speculate about why. Hi Alison, Great recipe. I added a tsp of Dijon mustard and cracked pepper to mine. Thanks for being here with these great recipes. Oh dear, I tried this today but it just will not emulsify. How long would you say you should need to blend it before it starts to thicken? I used rapeseed oil as this was all I had in the house (other than coconut oil); could this be why it didn’t work? Also, can anyone suggest an alternative use for the resulting mixture rather than just tipping it away? Thanks in advance. Hi Gill, it should be immediate. If you watch the video, we didn’t speed that up, it starts blending and it almost immediately starts turning into mayo. Any oil should really work. I’m not sure why it didn’t! 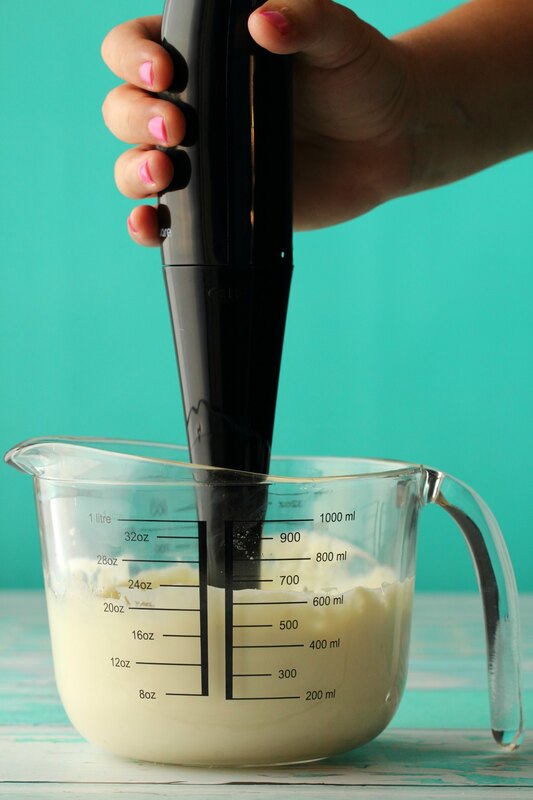 Did you use a regular blender or an immersion blender? Don’t throw the mix out, you can try and save it. I have managed to emulsify a mix that I tried to make (and failed) in a stand mixer. I then moved it to a bowl and used the immersion blender and it worked. Maybe just leave the mix for a bit and come back to it and try again. Hi, this looks really good. Can I substitute honey for maple syrup? Thanks! I only had sweetened soy milk so I tried making this with oat milk and it failed – never thickened. So then I ried with the sweetened soy milk and it worked out fine for me. I didn’t notice an aftertaste. Like others, I was amazed how immediately it thickened. A few days later I altered the recipe to put on top of berries. I used canola oil (didn’t have anything else on hand), sweetened soy milk, a couple tablespoons of lime juice instead of vinegar, a dash of salt, and a bit of honey. It thickened up nicely but predictably I could taste the canola oil. I will definitely try it with other types of oil. I wonder if Coconut oil might be a good fit here. Hi Jenn, we’ve never had an issue with the vinegar so didn’t have a reason to only add it in at the end, but if you think that’s the reason it didn’t work with the oat milk then that’s always worth a try! All the best! Would this work with water instead of milk?